This is Blonde on Blonde. This is Born to Run. This is quote after inspirational quote. This is Tom Liberatore’s moustache. And injured Mitch Wallis’s steely eyes. This is collective over self. It is luck shining on Charlie Bucket. This is magic and hope and joy. This is the existence of unicorns. It is Middle Earth; negotiating orcs and goblins and a fire breathing Balrog. Luke Beveridge as Gabe Kotter. Marcus Bontempelli, tapping the ball in its end, as Vinnie Barbarino. 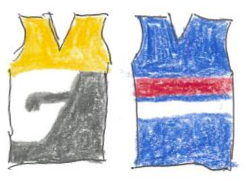 Jake Stringer, Easton Wood, Roughead, everyone else, injured Lin Jong, as the Sweathogs. This is rare fairytale country, now. And it is somehow also prosaic workmanlike country, now. It is Power in a Union. This is VAFA C Grade. A footy club as a footy club. This is $10 from the coach, in an envelope, for your Wodonga breakfast. This is the whole adding up to more than the sum of its parts. Doing what people can do. It is a leopard skin pill-box hat. Paul Kelly, Leaps and Bounds. Thanks for making some sense of how I feel at the moment. I am transported back to that seven-year old boy hanging on to his father’s hand at the G waiting for the Dogs to run out led by Charlie Sutton and a real Bulldog on a leash. I think Paul Kelly’s music would be running through Bob Murphy’s head at the moment. Captured the spiritus mundi of the Scray beautifully ER. The fairy tale element, fate, lifting the weight of history , from Sweathogs to Giant killers, their banner sticking it to AFL focus groups in the spirit of ‘Up Yours Oakley’. There might be an ‘Underdog’ narrative/mythology that is seductive for fans and scribes, but this Bulldogs team is skillful, hard,professional and very much aware of their ability to shape their destiny. Great job Er. Much prefer the Dogs narrative than any contrived Battle of/for Sydney/Bridge. Of the thoughts I had while watching none connected to Welcome Back Kotter. But, yes! However, I reckon Vinnie Barbarino would be a Carlton man. Should be a fun week. Looking forward to the Dogs stories on here, and elsewhere. Grand images ER. Capturing lightning in a bottle. Shivers in aspic. And yes, they are organised and skilled and there is a high level pragmatism to the footy as well. The Leicester City of the Aussie code perhaps? Quick hands and quicker minds. Brilliant Doggies, just brilliant. Perhaps the unicorn is no longer lonely. I can just see Bont singing…like Barbarino in Welcome Back Kotter.. I just saw Lin Jong get BOG in the VFL Grand Final. When Luke Beveridge came on the ground Jongy starting thrusting his arm forward Arnold Horshack-style saying , ‘” Ooh, ooh pick me for Saturday”. Love all of these comments. And the Welcome Back Kotter title song works in this case, too.For Luke Beveridge. Omen hunters, the dogs have beaten Sydney at the mcg in finals the last three times they have played them there! This has a real rhythm and beat going Dave. Perhaps you could put it to music. Rap…? Adam Briggs. Thanks Paubai- more omen talk – my mate Tommy was swimming in Lake Geneva overnight- he said the shore was littered with swan poo.